Just as 100 walkers arrive in Adelaide from Port Augusta, we will be walking through civic to MP Andrew Leigh’s office! We will be showing that there is support around Australia for renewable energy. 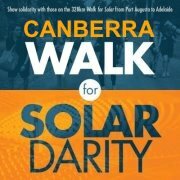 So come along to Walk for SOLARdarity and show our support for those amazing walkers in SA. This is the perfect time to link together with the recent announcement of the solar farm in Royalla, just outside Canberra, and also the ACT Greens & Labor publications of moving Canberra to be 90% powered by renewables by 2020. It shows great support for to renewable energy sources in Canberra, especially in large scale solar farms. So come along to support all Australian’s in building a big solar! We will be meeting at Garema Place at 10am. Then we’ll be heading over to Mr Leigh’s office in Braddon to tell him we support big solar in Australia!